The recent condemnation of Pamela Geller’s MUNI ads by the Jewish Community Relations Council and the American Jewish Committee could have provided an opening for dialogue, given the shared sentiments about those ads. Yet AROC has chosen not to use this as an opportunity to build bridges but rather to throw gasoline onto hot ashes and inflame the situation further. Your dismissal of the JCRC’s statement begins with astatement that you reject in other contexts: “We must not equate support for free speech with support for hate speech.” I completely agree. Can I assume that you then also condemn these exercises of free speech in San Francisco? 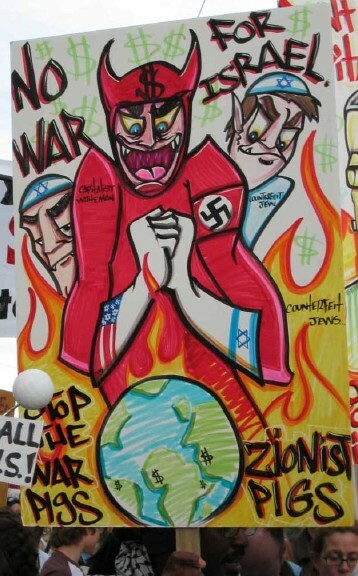 I'm sure the leaders of your group saw these in person at some of the many anti-Israel demonstrations held here. What about the new University of California report on campus anti-Semitism which explicitly states “The Principles of Community operate under the assumption that not all speech is protected. Words and accusations which at their core demean, defame and degrade must be addressed and denounced.” Will you join me in endorsing this statement, and condemn the repeated invitations by the Muslim Student Union at UC Irvine to hate speaker Amir Abdel Malik Ali? Unfortunately it appears that your answer will be in the negative, since your statement then moves sadly but predictably on to rhetoric that far exceeds Geller’s in explicit hate. Phrases such as “the racism that drives Zionism” are dropped throughout the rest of the statement, which labels any support of Israel,whether by JCRC or by Geller’s AFDI, as “based on racism and Islamophobia”. Any review of JCRC’s statements, whether on Israel or any other topic, is of course notably absent of any trace of either racism or Islamophobia, unless one adheres to your insistence that the very existence of a Jewish state is a racist endeavor. Since that appears to be your position, you might want to review the Working Definition of Anti-Semitism prepared by the European Union in 2002; I’m sure you agree that many Europeans are not the strongest friends of Israel and you might even be aware that the EU funds NGO’s in Israel and overseas that promote BDS and similar anti-Israel activities. Sadly, you have lived up to the expectation that you will apply blatant hypocrisy and double standards not only to any issue involving Israel, but to concepts such as free speech as well. Not that this a surprise coming from AROC. After all, it was AROC's own program director, Lily Haskell, who exercised her free speech rights in December 2008 (a few weeks after the untimely and tragic death of Dan Kliman z"l in an elevator accident) by threatening the lives of Israel advocates by leading chants of "Israel Supporters watch your backs, or we'll push you down a shaft!"